Moto G4: More Leaks And Rumors Reveal:As the stages are about set and Lenovo to unveils its new most popular Moto G on 17th May in New Delhi,India rumor are getting more hot as what to expect with new Moto G4 which also rises the customer demand as the Moto makes its ground on search engines and people are searching what new in leaks. Some leaks are showing the leaked images and FCC filings point to the next Moto G being offered in two sizes, with a larger “Plus” model which may get two offering from budget phones as we only get these type of offering from flagship which is meant to compete with market to offering two choices. According to leakster @evleaks who leaks the photo of regular size of Moto G4 while they also mention about “Plus” model may miss physical home button. While the square button on the centre which equipped with that square-shaped button has been seen on leaked photos of the upcoming Moto X and the 4th-generation Moto G which is basically a fingerprint sensor. While only Plus model may have fingerprint sensor and normal 5-inch model will have onscreen button as seen from the images.These rumors also be confirmed as the company Motorola phones have been certified by FCC for the product model numbers of XT1622 and XT1642 which suggest that it will the upcoming Moto G4 and G4 Plus given that last year’s Moto G3 was the XT1540. While this rumor are keep Moto G at hot search list. 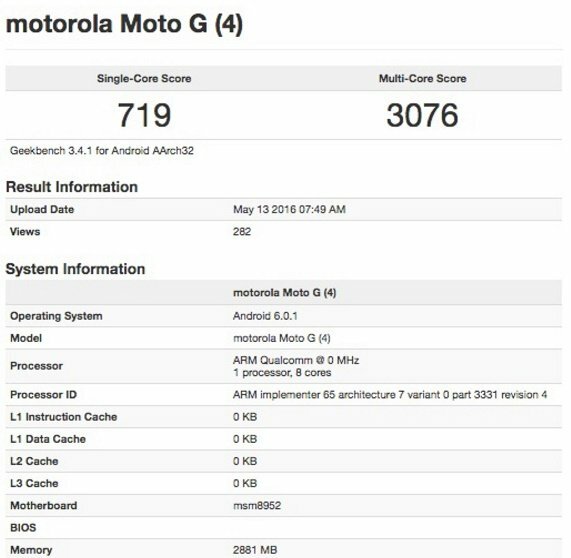 Moto G4 also spotted on benchmarking site Geekbench with it single core score 719 and Multi-Core Score is 3076 which is quite interesting while it include Qualcomm’s Snapdragon 617 octa-core Soc with 3GB of RAM which enough to making device a powerhouse for all the work. Moto G4 come out box with Android’s Marshmallow. Snapdragon 617 is best and snappy processor which done the work with consuming less battery which is beneficial fo Moto G to run for more hour. A photo leaked few days ago which is expected of Moto G4 Plus which sports 5.5-inch display with 1080p resolution and other smaller in size Moto G4 may sport 5-inch display which may get 720p resolution while the both screen may LED with all the technology as Active Display and also get Always On Display. 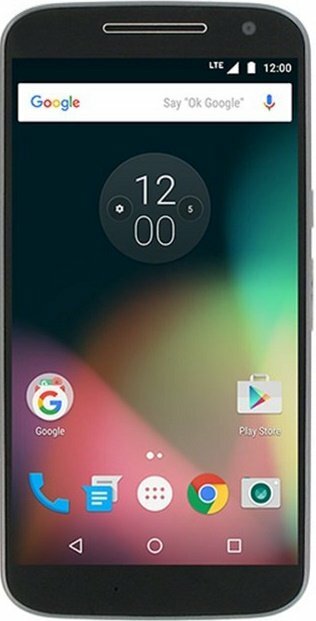 Camera of new Moto G4 Plus may sport 16-megapixel rear camera with laser auto-focus technology and much more while the front camera is 5-megapixel shooter may support screen flash. While Moto G4 may have 13-megapixel primary camera. The Moto G4 two model may include different memory the lower one with 2GB of RAM and 16GB of memory while the higher spec or the Plus model may have 3GB of RAM and 32GB of storage and both model may include memory expansion slot to support up-to 128GB. As far as connectivity concern both Moto G have LTE support, also have Wi-Fi 802.11ac with Bluetooth v4.2 and also have NFC for Android Pay feature and other easy connectivity. The Moto G4 and G4 Plus may comes in two color as the leaked photos of the new phones show a standard slab design in black and white. As from the design it looks Lenovo complete overhauling the entire Moto design element. While the Moto X also include the whole new metal design as previous X generation uses plastic or other material. More news for Moto G4 and G4 Plus stay tuned for all the latest update as the announcement of Moto G series on May 17th.